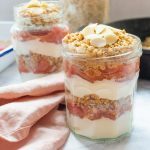 Layers of yogurt, fruit and toasted oats make up this tasty breakfast parfait! It’s a quick and easy breakfast recipe to throw together, even on a busy morning. Plus, using a few simple swaps, it can be made vegan! Add your porridge oats to a frying pan or and turn on to a medium heat. Toast the oats for 5-7 minutes until they become golden brown and give off a nutty aroma. Add the butter and honey and stir regularly until the butter has melted and the oats are evenly coated in butter and honey. Turn off the heat. Leave aside to cool for 5 minutes while you prepare the remaining ingredients for the parfait. Set out 4 jars or bowls. Add two heaped tablespoons of yoghurt to the bottom of the jar. Add a layer of fruit to each jar, then a layer of toasted oats. Repeat this so you have 6 layers in total. Sprinkle with flaked almonds.